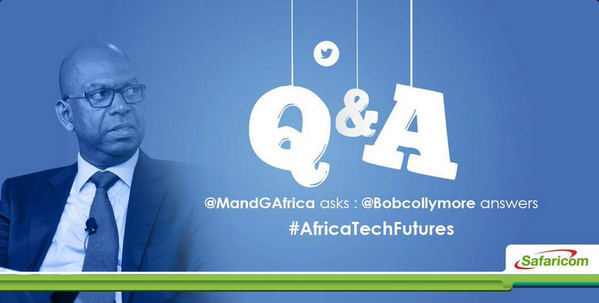 Safaricom CEO Bob Collymore held a live Twitter chat with Mail & Guardian Africa under the hashtag #AfricaTechFutures. The session tackled different aspects of the Tech industry ranging from the current trends to Safaricom and factors likely to affect the general direction of technology in Africa. “Something that’d let me track customer sentiment in real time a heat map of issues at call centers”, That’s Safaricom’s CEO biggest tech wishlist. Safaricom has previously won awards for the use of social media platforms in provision of customer care services but a large chunk of queries and complaints are channeled through calls. Still the firm struggles to satisfy the demand for customer care services even with a dedicated call centre, which may have informed the CEO’s innovation wishlist. In addition to timely response to customer query, a lot of data on products and services is channeled through these calls. The ability to harness and convert this data to meaningful information capable of informing decision making is a technology any organization would desire to own. Such a solution would tap into the power of big data which, the CEO called on of the most underplayed tech trend in Africa. Companies like Facebook, Google, Microsoft and other multinationals have leveraged collection of user data to develop better solutions for them. Google as an advertiser is able to gather intelligence to serve more relevant ads. Facebook does the same and we have seen them make acquisitions to better provide them with information. WhatsApp acquisition is one such landmark acquisition. Should Safaricom make these strides then it will stay on the top of things for ages to come. The CEO lauded the partnership existing between Banks and Telcos that has allowed for the deepening of financial inclusion. Currently, Kenya leads in mobile money globally with a Central Bank of Kenya stating that up to 43% of Kenya’s GDP passes through mobile money services with Safaricom’s M-pesa leading the bulk. A report by the Kenya National Bureau of statistics places the number of mobile money subscriptions at 26 million users representing a 60.6% penetration rate. Cash deposits made through mobile agents stand at Kshs. 1.3 Trillion while transfers through mobile money stood at Kshs. 2.4 Trillion. During the announcing of its financial results, Safaricom alluded to the slowdown in voice revenue Voice revenue grew 4% to Kshs 87.4 Billion. However, the CEO thinks there is space to grow voice. Currently mobile penetration stands at 65% in Africa and expected to rise to 91% which is a space to grow voice especially in rural areas. Its important to note that VOIP services such as Whatsapp Voice are an emerging threat to voice revenues allover the world. Internet messaging has also dented voice revenues.